New York based motorcycle company Vanguard Motorcycles is unveiling its first bike. 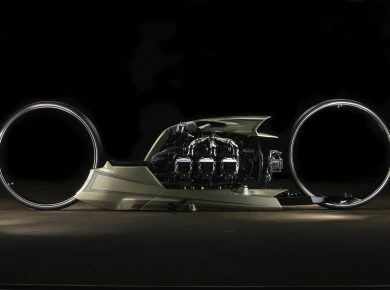 The Roadster is a massive, frameless nakedbike built around and upon a giant 1917cc v-twin engine. The motor is a modified S&S X-Wedge, a 56-degree v-twin that has been built around as the central structural unit of the bike. The cylinders themselves form a kind of cradle frame, and that whopping swingarm/shaft drive bolts right on behind the rear cylinder. The upper half of the bike sits firmly on top of the cylinder heads, with the lower line of the seat and carbon tank forming a flat aluminum platform. The single-seat tail unit is almost impossibly thin, with minimal seat padding. The exhaust is fully integrated, exiting from an anonymous slot at the bottom of the bike. Other interesting touches include the dash, which is a tablet-sized color screen that also serves as a mirror thanks to a rear-facing camera integrated in the tail unit. The headlights are barely there, six tiny units (perhaps LED based – the spec sheets don’t specify) housed in transparent shards between the front forks. The overall target weight for the bike is 550 lb (250 kg), which is about 110 lb (50 kg) overweight compared to most naked bikes, but still surprisingly light given that it looks like it’s built to survive a head-on with an 18-wheeler. And while no horsepower figures are provided, that giant 117 ci v-twin will smash out more than enough torque to make this a true tarmac-ripper. At US$29,995, with production slated for 2018, the Vanguard Roadster is at the premium end of the market.